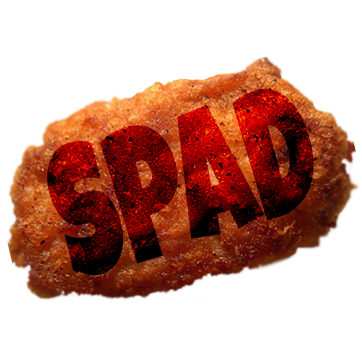 It’s with great excitement that I announce a formal move into the producing circuit with the launch of SPAD NUGGET. SPAD NUGGET is a multi-media production company focused on generating creative content specifically for social media and artists’ portfolios, objectively decreasing cost and increasing lolz. The company is inspired from an infamous nugget, known far and wide by the citizens of the Flemington province of Newest Jersey. Approved by the FDA, the nugget is known for building anticipation, used by the United States Military as emergency rations and to boost morale, and rumored to be satisfying to revisit after being put to fridge. This entry was posted in Film, New Media, Producing, TV and tagged [Blank] My Life, multi-media, production company, Spad Nugget, SpadNugget. Bookmark the permalink.